PS Review of Freemasonry meets the Australian and New Zealand Masonic Research Council. The Australian & New Zealand Masonic Research Council (ANZMRC) is an inter-jurisdictional association of research lodges for the promotion of Masonic research and education on an international basis. United Grand Lodge of Victoria, Australia. The 2000 Kellerman Lecture for Victoria, published in ANZMRC Proceedings 2000. Abstract: Referring to the Retrospect of the Third Degree (UGLV), this paper briefly outlines the Masonic approach to individual development, past influences on this approach and the contribution Freemasonry can make to an ever-changing world. It is argued that the lack of community awareness and acceptance of the Craft is partly due to an inadequate conceptual understanding of Freemasonry by its membership in general, which has resulted in the failure of the Craft to remain socially and culturally relevant. A conceptual model is developed to help focus attention on the central attributes of the Craft and to improve social relevance. The conceptual model also provides a coherent framework for future Masonic research. One of the objectives of Freemasonry, as promoted by the United Grand Lodge of Victoria (Appendix A), is to ‘Provide opportunities for self development’. Self-development is the growth of the individual person’s abilities by the individual himself. Such development can of course be greatly influenced by the people and organisations with which the individual relates. ANZMRC publishes a quarterly newsletter, Harashim (Hebrew for Craftsmen), which is circulated worldwide in PDF format by email. Subscribe Harashim. In previous periods of operative masonry, the craft guilds were largely concerned with the development of the individual as a skilled craftsman. The operative stone mason left the ranks of Apprentice and became a Fellow of the Craft when he was able to demonstrate that he was a skilled workman who had mastered the requirements of his trade. With the development of speculative Freemasonry, self-development was expanded to include a broadening of the mind, intellect and talents in general, through education and learning, not only for individual benefit but for the greater benefit of society in general (Information For Fellowcraft, UGLV). This paper will examine the current Masonic approach to self-development, by considering the Craft’s understanding of the world and the individual, some streams of thought that have influenced current Masonic views, and future implications for the Craft. The state of the world and the individual’s interpretation of it greatly affect the range of opportunities for self-development. The unified view that Freemasonry holds about the universe, and the individual’s place within it, is contained in the rituals of the first, second and third degrees, and is summarised in the Retrospect of the Third Degree (Appendix B). Freemasonry perceives the universe to be composed of two dimensions, material and spiritual. With regard to the spiritual dimension, Freemasonry takes a monotheistic view. That is, one God is acknowledged, and is believed to exist as a distinct being, who created the world and who works through and in the world. God also being the ultimate basis for determining moral and good human behaviour.
. . . above all, it taught you to bend with humility and resignation to the will of the GAOTU, and to dedicate your heart, thus purified from every baneful and malignant passion, fitted only for the reception of truth and virtue, as well to His glory as the welfare of your fellow-creatures.
. . . you were led in the second degree, to contemplate the intellectual faculty . . . The Retrospect provides a very useful outline of the Masonic approach to the material world, as it contains guidelines for individual behaviour and self-development. Truth 1. That we all enter this world helpless and dependent on others for our immediate survival and development. Truth 2. That we also enter this world equal, not in terms of physical attributes or mental abilities or material endowments, but in terms of our mortal condition. Truth 3. That because human beings share a common mortality and dependence upon each other, there is the need for charity and support one another, particularly in times of trouble or distress. Truth 4. That self-development is achieved by the expansion of the intellect through the study of nature and science, and the application of reason to the experiences of life. Truth 5. That the active pursuit of reason and the expansion of the intellectual faculty, subject to the will of God, will lead ultimately to truth and virtue, that is, a totally fulfilled life. Hence we see that, while human mortality and universal charity are emphasised, Freemasonry considers self-development largely in terms of the expansion of reason and the human intellect. Freemasonry is part of a long historical tradition which defines personal development in terms of the intellectual faculty. Thinkers and writers up to the nineteenth century, with their emphasis on reason and the intellect, the development of rational systems, and the importance of experience and observation, can be seen to have had considerable influence upon the Masonic view of self-development. This paper shall briefly outline these three influences. Reason, knowledge and the intellect, since at least the time of the ancient Greeks, have been recognised as central to an understanding of life and the universe. Plato (c.427–c.347 bce, The Republic) saw the soul as being divided into three parts; the rational part or intellect, the will, and the appetite or desire. He saw the ideal society, like the soul, also being partitioned into three sections or classes, the philosopher kings, the guardians, and the ordinary citizens. The philosopher kings were to lead the people, for by reason and thought they came closest to an understanding of truth and ultimate reality—what he called ‘ideas’ or ‘forms’. Aristotle (384–322 bce, Metaphysics) did not speak of a separate world of ‘forms’ or ‘ideas’. He maintained that the world of the senses, or the material world, is the real one. Aristotle sought to find, by reason, cause-and-effect relationships between things in the world. The early Christian writers tried to interpret Christianity and to relate it to the philosophy of the ancient Greeks and Romans. St Augustine (345–430, The City of God) taught that all history is purposeful or directed by God. He is above everything, and human beings and the world are God’s creation. The supreme goal of human beings is a mystical union with God. St Thomas Aquinas (1265, Summa Theologica), who was influenced by Aristotle, took religious philosophy a step further. He argued that the universe was organised on the basis of reason, and that a knowledge of it leads to God. He said that a person should use both faith and reason in believing in God. Freemasonry does not see a conflict between scientific endeavour and a belief in God. It views knowledge about the universe as leading to a better understanding of the creative laws of TGAOTU. As a consequence, Freemasonry emphasises the importance of the intellect and reason in coming to understand the universe and the place of human beings in it. By the use of their intellect, human beings have been slowly able, through observation and reason, to develop an understanding of the physical, emotional and spiritual environments, or systems, in which we operate. A system is a mental image which assists us to understand a more complex reality; for example, a river system, a legal system, or a number system. It helps us to obtain an overview of the whole situation, and to understand the important variables that affect the object being studied. It was during the period of the European Renaissance (1400–1600), that scientists used observation and reason to investigate the physical characteristics of the earth and to develop the concept of a solar system. Nicolaus Copernicus, Galileo and Johannes Kepler saw themselves as discovering physical truths through reason. They laid the foundation of measurement, experiment and mathematics upon which Sir Isaac Newton (1687, Principia Mathematica) built his great system of the world. Newton, in fact, described the world as a giant machine, or system. The systems view of understanding is clearly evident in Masonic teaching, as seen from the answer given by the second degree candidate to the question, What is Freemasonry? ‘A peculiar system of morality, veiled in allegory and illustrated by symbols’ (Degree Ritual, UGLV 1991, p 51). During the 1700s, influenced by Newton’s work, philosophers adopted a practical approach, and believed that experience and observation gave rise to knowledge. For example, John Locke (1690, Essay Concerning Human Understanding), spoke of the mind as a blank tablet upon which experience writes. Experience acts on the mind through sensation and reflections and these two processes give human beings their ideas and understandings. David Hume (1739–1740, A Treatise of Human Nature) also argued that all our knowledge is limited to what we experience; that the only things we can know are objects and events of sense perception and experience. Masonic teaching emphasises the importance of experience and observation, not just visual observation but also mental observation or contemplation. From the Retrospect we see the importance of experience and the contemplation of that experience for gaining an understanding of ourselves, life and death. 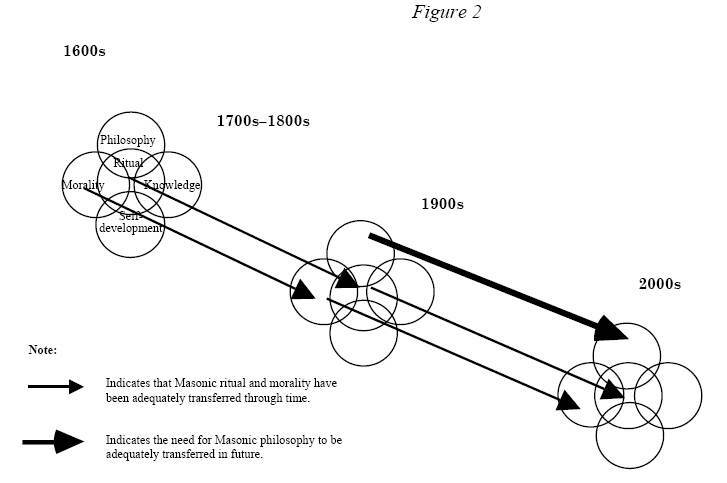 The Masonic view of self-development has been influenced by past philosophers, and particularly by the development of scientific method following the European Renaissance. Freemasonry understands self-development in terms of an increase in knowledge, acquired by observation, reasoning, experiment, measurement and the construction of mental systems, to assist an understanding of the world and the meaning of human life. As a system of rational personal development, Freemasonry has an important role to play, both now and in the future—although the world of the mid-21st century will be substantially different from that of today. The wonderful thing about the future is that it can be guessed at. The future is not known, for the universe and human life are full of paradox and surprise (Adams, 1992). Nevertheless, tomorrow is connected to yesterday via today, and we can discern trends that are likely to become major characteristics of future society which will substantially affect individual self-development. These trends include an increase in personal freedom, an increase in scientific discovery, and an increase in the rate of social change. This paper shall briefly consider these trends and their implication for personal development and the role of Freemasonry. Since the mid 1700s there has been an expansion of theory and practice supporting increased individual freedom, particularly in the areas of the economy, government and society. For example, there has been the development of national economic systems based largely on the theory of competitive markets, in which individual freedom to make production and distribution decisions is paramount. In government, the fundamental individual liberties of expression, religion, assembly and equity have been enshrined in Bills of Rights, constitutions and laws. In society there has been the development of a philosophical perspective (sometimes called existentialism) which encourages social and behavioural experimentation, human life being seen basically as a series of decisions that must be made with no way of knowing conclusively what the correct choices are. In a world of increasing personal options, individuals will have greater freedom to make their own choices. But they will also be increasingly made accountable for their choices. Many areas of science and intellectual endeavour are making important contributions to our understanding of the world and self-development. For example: in chemistry, with the development of polymers, synthetic fibres, compounds and pharmaceutical drugs; in microelectronics, with the development of the micro-chip, the computer, the visual display unit and communication networks; in medicine, with the development of ultra-sound diagnosis, fibre optics and laser beam surgery, organ replacement and repair operations; in genetics, with the manipulation and evolution of the DNA code of animals, vegetables, and bacteria; and in astronomy, with the use of satellites to help discover the history of the universe. The pace of scientific discovery is increasing over time and the effects are having a profound impact on the way in which we understand and interpret the world, and experience life. The effect of increasing personal freedom and increasing scientific discovery is that the individual in the twenty-first century will face a world characterised by an increasing rate of change. Such change can be enormously beneficial, but the difficulty for the individual is one of adjusting to an increasingly transient world. What Alvin Toffler (1972) called ‘future shock’ will be suffered by many people. The failure to effectively adapt to social change can result in the individual suffering a sense of insecurity, disorientation, alienation, and ultimately a lack of meaning of self and of life in general. Here then, is a major role for Freemasonry in this age of individualism, materialism, free choice and transience: to provide a moral basis for wise decision-making and self-development. Freemasonry, through its well-defined and stable authority structures, rituals and illuminating allegories, provides an environment of peace and harmony in which the intellectual faculty is encouraged to develop and in which moral values and wisdom are fostered in the individual. Freemasonry emphasises that self-development depends upon the individual’s improved knowledge and understanding of himself and the world about him. Freemasonry reminds us that self-development is undertaken in a material world, and that the development of the intellectual faculty occurs within a mortal body. It uses the tools of operative masons and translates their use into moral values and the building of the spirit. It leads the individual ultimately to recognise that reverence and respect for God is wisdom, and that to shun evil is understanding (Job 28:28). Although Freemasonry is veiled by the mist of the past, it points to God and eternity. It is concerned with the past, the present and the future, and belongs to future ages. (Wiley Odell May, in Dewar, 1966, preface) Freemasonry has an important role to play in providing responsible opportunities for individual self-development, for its members and others, in a world which is increasingly characterised by creative individualism, scientific discovery and pervasive change. There remains an unanswered question. If Freemasonry has an important role to play in providing responsible opportunities for self-development for its members and others in the twenty-first century, why is this not generally acknowledged by the community? It could be because Freemasonry lacks an adequate understanding of itself, and because it lacks an outlook recognised by the community as relevant to the twenty-first century. Prior to undertaking the second degree ceremony, the candidate is asked, ‘What is Freemasonry?’ and the required response is, ‘A peculiar system of morality, veiled in allegory and illustrated by symbols’. (Degree Ritual, UGLV 1991, p 51). But this is only a partial truth. Freemasonry is not simply a peculiar system of morality veiled in allegory and illustrated by symbols. First and foremost it is a way of understanding the universe in which we live and how we relate to it and to one another. Before you can have a morality or morality system, you must have understanding, a conceptual view of the world and humans within it. Understanding precedes morality. Morality is simply acceptable motivation and behaviour, based on a given understanding of the world. There is the need for a new approach, a conceptual analysis of Freemasonry. The explanation of the Masonic approach to self-development presented in this paper suggests the following conceptual model (Figure 1) of interrelated components. This paper in fact provides and initial exploration of the ritual, philosophy and self-development components of this model of Freemasonry. The paper also implies that the significance of the model components may vary over time. That is, the model is not static. The important role that Freemasonry can play in the twenty-first century is not generally acknowledged, because the community does not see Freemasonry as relevant. Aspects of morality and charity have been effectively passed from one generation of Craft brethren to the next via Masonic ritual. However, there has been a failure to adequately spell out the philosophy, the outlook and assumptions, underpinning Freemasonry, and a failure of the Masonic approach to adequately respond to changing individual and community values. Figure 2 provides a diagrammatic representation of the problem. A brief outline of the development of western values and perspectives since 1600 will illustrate how Freemasonry has failed to remain relevant in an ever changing world. Recent historical research indicates that Freemasonry was very much influenced by the English and French Enlightenment which began in the 1600s and lasted till the late 1700s. The Enlightenment was characterised by the view that knowledge and society is not advanced by habit or superstition, but by reason, that is, by logic and the rational scientific approach to understanding. The Enlightenment saw the continuing separation of the State from the Church, with men and women increasingly putting their fate in their own hands rather than in that of God or the Church. The Enlightenment was also characterised by the notion that the law should be based on natural and equal rights for all. That is, the right of education, freedom of speech and religion. The period of the Enlightenment was accompanied by the rise of British middle-class respectability and semi-religious activities, and the establishment of gentlemen’s studies, libraries, galleries, clubs, societies—and Freemasonry. *and the acceptability of secrecy in organisations to control membership and standards. * an awareness of the conflict of objectives. The invisible hand is not seen to operate, and what is good for the individual is not necessarily good for society: for example, the need to reconcile individual liberty on the one hand, with equality on the other. There is also the demand for confirmed historical accuracy, with a general ignorance of the Bible, particularly the Old Testament. There is an acceptance of the link between education, scientific reasoning and understanding, but not necessarily between education and the discovery of truth. It is acknowledged that there are few rational truths or absolutes. Statements about the world or human behaviour are never certain, they are only probable at best, and value systems are based largely upon situational ethics. There is the declining importance of skilled physical labour and trade labour, and the increasing requirement for organisational accountability and transparency. (1) more specific and precise definition of the model components: for example, a more complete understanding of current theories of knowledge formation and learning. (2) more complete analysis of the key relationships between the model components: for example, the link between philosophy (such as Buddhism) and Masonic ritual. (3) the measurement and quantification of the model components and the direction and strength of the key relationships between the components: for example, the relationship of morality (such as beneficence) to self-development. (4) the change in the model components and relationships over time: for example, the impact of World War Two veterans upon the development of Freemasonry. (5) the application of the conceptual model to the analysis of organisational performance: for example, the divergent roles and functions of Grand Lodge and warranted lodges. There is no doubt that Freemasonry has a great deal to offer in terms of wise decision-making in an increasingly transient world. Whether Freemasonry will make a substantial positive contribution to future society will ultimately depend upon reconciling the disparity between the philosophy, the perspectives and assumptions of Freemasonry, and current community perceptions and values. The way forward is not to double our efforts on ritual, or to increase our benevolence, or even to strive for new members. These will necessarily follow if we rediscover the Masonic vision of the ritual-writers. To go forward we must first understand the philosophy upon which our ritual is based. Then we must reinterpret that philosophy in the light of a changed world. For example, it is about developing a meaningful understanding of God for all monotheistic believers. It is about uniting these believers into a caring, peaceful and harmonious brotherhood, which transcends religious, cultural, national, ethnic and locational boundaries and barriers. It is not about secrecy and exclusion. It is about world community, expansive inclusion, transparency and accountability. It is not simply about benevolence shown to those in distress, the aged, the sick, the poor, and disaster victims. It is equally about the moral development of the young, through the removal of discrimination and vilification and through such activities as drug-free sport and recreation. It is about the development of the skill and intellectual levels of all humans to ensure sustainable families, friendships, communities, and material lifestyles. It is about moral regeneration, in all aspects of life. And it begins with the individual, the young and the family. We failed to capitalise on the large Masonic memberships of the 1950s and 1960s because of excess secrecy, habit and protocol. In effect, we locked our families out of Freemasonry. The Masonic vision is about providing its members with a moral basis for decision-making. It is about values and standards based on a VSL, not upon professional association standards and situational ethics. To catch the Masonic vision requires a return to the underlying principles and tenets, the philosophy, upon which Freemasonry is founded. And having understood that philosophy, to interpret and apply it to a radically changed world. Adams, P: ‘Choosing the Right Direction for Change’ in the Weekend Australian, 27/28 June 1992, p 18. Beagley, D: ‘Enlightened Histories of Our Times’ in Freemasonry Victoria, Issue 83 February 2000, pp 14–15. Brewer, J: The Pleasures Of The Imagination: English Culture in the 18th Century, Harper Collins. Dewar, J: The Unlocked Secret: Freemasonry Examined, William Kimber & Co, London 1966. Holy Bible (1994) New International Version, Zondervan. Rees, J: ‘Spirituality in Freemasonry’, Canonbury Masonic Research Centre, London March 2000, <http//www.canonbury.ac.uk/closed/lectures/julian.htm>. Roche, D: France in The Enlightenment, trans A Goldhammer, Harvard University Press. Toffler, A: Future Shock, Pan Books 1972. United Grand Lodge of Victoria: Degree Ritual (1st 2nd & 3rd Degrees) 1991. ——— Information for Fellow Crafts. World Book Encyclopedia (1982) vol 1, pp 129–130; vol 15 pp 345–352. and the relative dependence of its several parts. peculiar object of the third degree in Freemasonry. you are doubtless aware, the principal architect. Masonic Research in Australia and New Zealand. Full membership is open only to research bodies in Australia and New Zealand, but associate membership is extended to research bodies worldwide, and ANZMRC has associates in Africa, America, Asia and Europe. Every two years ANZMRC holds a three-day conference at which major research papers, designated Kellerman Lectures, are presented. These are published prior to the conference in ANZMRC Proceedings. The venue for conferences is rotated between New Zealand and the six states of Australia. In the ‘off’ years when a conference is not held, ANZMRC organizes a lecture tour by an overseas Masonic scholar, and publishes a book of the lectures offered in the tour. Past lecturers include: Yasha Beresiner, Robert Cooper, Neville Barker Cryer, James Daniel, John Hamill and Wallace McLeod. ANZMRC publishes a quarterly newsletter, Harashim (Hebrew for Craftsmen), which is circulated worldwide in PDF format by email. This contains research articles (originals & reprints), book reviews, news and comment. ANZMRC is also developing a digital library of full-text research papers from Australia and New Zealand (about 2000 to date). Membership of ANZMRC is restricted to organizations (lodges, study circles, etc), but its products (publications, lectures, etc) are available to individuals (Masons and non-Masons). Colin Heyward (Secretary) or Kent Henderson (Assistant Secretary). For further information please visit ANZMRC website.